Supernatural returns Dean to his old self and picks up a thread intended to be explored in the sadly unrealised Wayward Sisters spin-off. Dean being back so soon is something I’m concerned about as there has potentially been a lot of storytelling potential lost by having Michael disappear from his body this early in the season. Last week showed that Michael had a very definitive plan that was completely on track so I have to assume that leaving Dean is part of that and it will all make sense before too long. 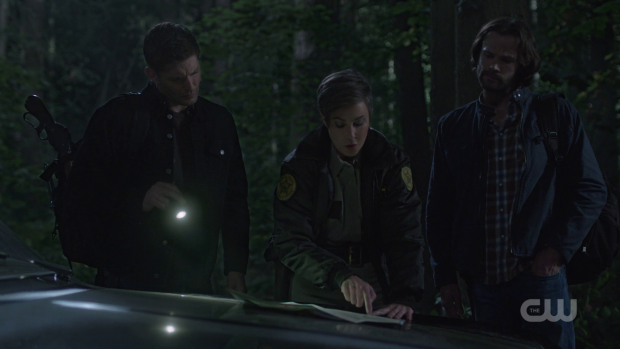 This episode wastes no time in categorically confirming that Dean is back through a really natural brotherly interaction where Dean makes fun of Sam’s beard. It’s a very Human moment that brings in some organic levity to the situation. No matter how bad things are brothers can still make fun of one another and that’s a big part of what makes this show so appealing even after all these years. Naturally a chunk of the running time is devoted to exploring how Dean feels after being possessed by Michael for an extended period of time. In true Dean tradition he just wants to move on and get on with his life but as always there’s something deeper going on that he refuses to deal with. Sam tries to talk to him early on and encourage him to open up about how he feels. Dean claims to not remember what Michael did with his body but it’s clear that he’s not being upfront about everything and Sam recognises that because he’s seen Dean behave this way on many occasions. It’s well documented that he often confuses fear and anger so the terror associated with potentially encountering Michael again is actually manifesting as an unflinching desire to confront the problem. The issue is that he won’t be at his best if he’s distracted by conflicting feelings so Sam is eager to ensure that doesn’t happen by having Dean confront those feelings. Of course Dean is unwilling at this point which causes further frustration. Eventually he confesses that he is aware of the time gap even if the details are somewhat fuzzy but he does remember constantly feeling like he was drowning as Michael kept him buried deep inside his own mind. No matter how hard Dean fought he couldn’t escape so he feels responsible for the horrible things Michael did because he decided to let Michael in. Even though he did so for arguably the right reasons he sees being unable to stop Michael as a failure on his part and he intends to make that right by relentlessly pursuing him until Michael is dead. It’s difficult to invest in this completely as there’s something repetitive about the way this comes across. It’s consistent with Dean’s earlier behaviour when dealing with similar upheavals to his life in the past but I also don’t feel that anything new is really coming out of this so it comes across as being more of the same. As always Jensen Ackles plays the part well though sadly this pushes Sam into the background once again after a couple of episodes of receiving some meaningful development. With any luck that won’t be pushed aside in favour of a Dean centric plot where he has to deal with his feelings post possession. His anger and impatience is seeded throughout the episode in how he wants to deal with the their prisoner. He insists that there’s no time to take her anywhere else and that she has to be broken as quickly as possible. After this he skips straight to torture further showing how unhinged he is. Once again this does the intended job but doesn’t offer any greater insight into who Dean is as a person considering he has been through this all before. At least the plot connects to the Michael story while still being somewhat its own thing. Back in last season’s “Wayward Sisters” Yadira Guevara-Pip’s Kaia was killed before teasing that her counterpart from an alternate universe had crossed over and was on the loose. This was clearly something that the Wayward Sisters TV show would explore to a great extent but since that show sadly didn’t get picked up it’s down to this show to pick that up and do something with it. Kaia is a person of interest because her weapon is capable of injuring an Archangel as evidenced by the titular scar that Dean doesn’t remember getting. A mind probe from Cas reveals that Michael went to recruit Kaia into his army only to have her refuse and injure him by stabbing him with the weapon. In the flashback Michael talks about a War being on the horizon so Sam and Dean need as many advantages as they can get their hands on. 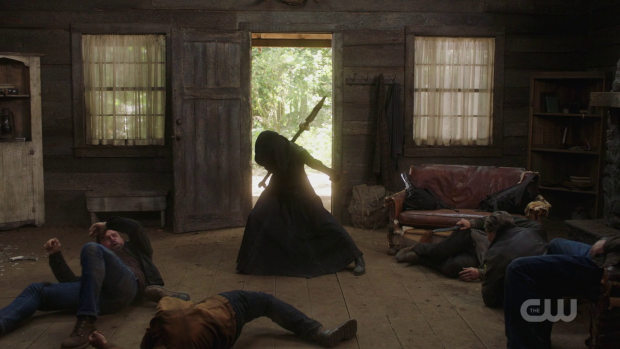 Kaia’s weapon would offer an excellent defence against Michael once he puts his plan into motion. The problem is that Kaia isn’t interested in helping them or handing the weapon over. Sam reminds her that she is constantly going to be looking over her shoulder as long as she has that weapon but Kaia is used to living like that leaves. This leaves her on the board as a random element that could go either way in the upcoming conflict. Equally she could remain self serving and not get involved but either way I doubt this will be the last appearance of her Archangel harming spear. In terms of plot movement this whole mission ends up being a bust but it does allow for important and compelling character development for Jody. She spends the episode talking about keeping Claire in the dark about this hunt despite her promise to include her in anything monster related. In this case she doesn’t tell Claire because she wants to protect her from facing this alternate version of Kaia. Jody looks at the familiar face and sees her own failure to keep a young woman safe. Whether it was her fault or not she still blames herself to a large extent and becomes somewhat overprotective in keeping Claire away from this. By the end of the episode she realises that Claire deserves to know that Kaia’s killer -accidental or not- is still on the loose and resolves to be honest with her about what happened. This is all well and good but without seeing Claire’s reaction to Jody keeping this from her it can only go so far. It’s always good to see Jody in an episode but there was a lot more that could have been done here by taking advantage of the meaningful connections that exist between her and those she has adopted. Claire’s absence was likely caused by the lack of actor availability but the execution here felt like one piece of a much larger puzzle that may not ever be completed. Back in the bunker, Jack and Cas deal with a young woman who has been cursed with an ageing spell by a dying Witch and try to figure out a way to save here. This plot is basically designed to show that Jack isn’t useless without his powers while showing his ability to keep cool in a crisis and think laterally when dealing with difficult situations. We also see another example of him embracing his Humanity thought showing kindness when he tries to comfort Lora (Natasha Calis) as her time grows ever shorter. It’s not a bad plot and makes good use of Jack’s relationship with Cas. Jack even says that Cas is one of his fathers which is echoed later in the episode when Cas talks about how proud he is of the way Jack acted in this situation. Misha Collins adds a paternal edge to his performance that works wonderfully and his offer of taking him on his first hunting trip since he lost his powers is really endearing. I’m not sure what to make of Jack coughing up blood at the end of the episode though it might be interesting if he is struck down by a very Human condition like Cancer or something similar. 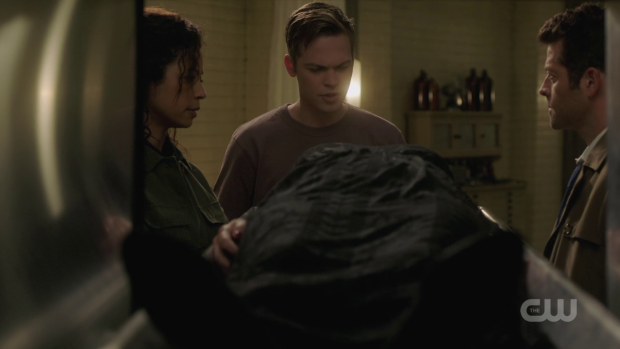 A solid if underwhelming episode that covers well worn ground in terms of how Dean deals with upheavals in his life. The return of alternate Kaia is fine as plots go. It does a good job of connecting to the overarching Michael story while being its own thing at the same time. It’s a much more valuable story for Jody who is reminded of her failure to protect the other Kaia and has to deal with not letting Claire know what she is dealing with. It’s slightly empty because the other side of that is missing with Claire being absent but having Jody around is always good and she is used fairly well here. The other story where Jack and Cas work on saving a young woman from a Witches Curse works well enough as a development point for Jack who shows his ability to be cool in a crisis as well as think laterally around certain problems. The Jack/Cas relationship also receives some important attention through the confirmation that Cas is one of his fathers. This is picked up later in the episode when Cas tells Jack how proud he is and offers to take him on his first depowered hunting trip. Jack coughing up blood could be interesting if he has to deal with a distinctly Human problem.